In mid-century America generalizations about race and juries’ penchant for assumed guilt were being re-examined. Guilty verdicts for people of color revealed a predisposition to convict, regardless of whether the defendant was innocent or guilty. Countless TV dramas and several films have been made of Rose’s drama, and it is said that Supreme Court Justice Sonia Sotomayor chose to pursue her law degree after seeing Sidney Lumet’s 1957 movie of it. 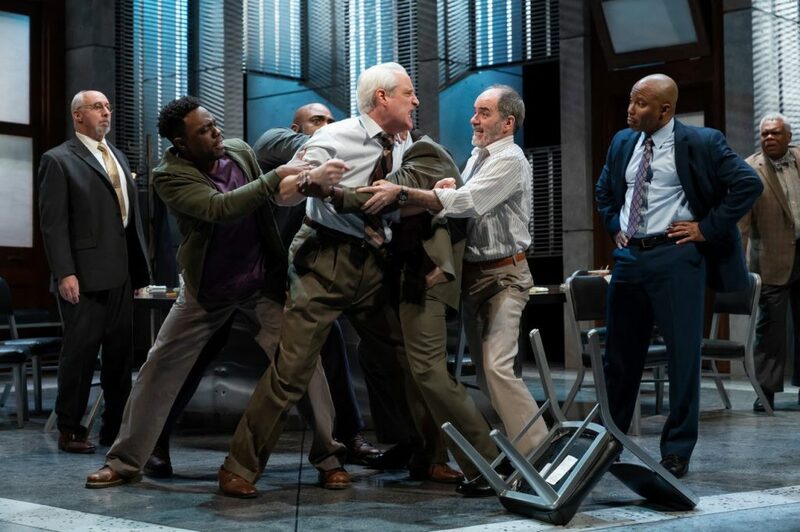 Twelve Angry Men will never go out of date. Its relevance is undeniable. We see injustice in courtrooms every day all over the world. Though the universal search for justice and truth is a primary tenet in civilized societies, we see its failures and foibles on a daily basis. While some defendants are found guilty, others are found innocent of the same crimes, even if based on a similar series of facts. We ask ourselves, ‘If the defendant was white would the verdict have been different?’ If he or she had more skilled representation, would they have gotten off. The Innocence Project tells us that prejudice and the convictions of those who are poorly represented, is far too often the case. Cast of the Ford’s Theatre production of Twelve Angry Men. Photo by Scott Suchman. 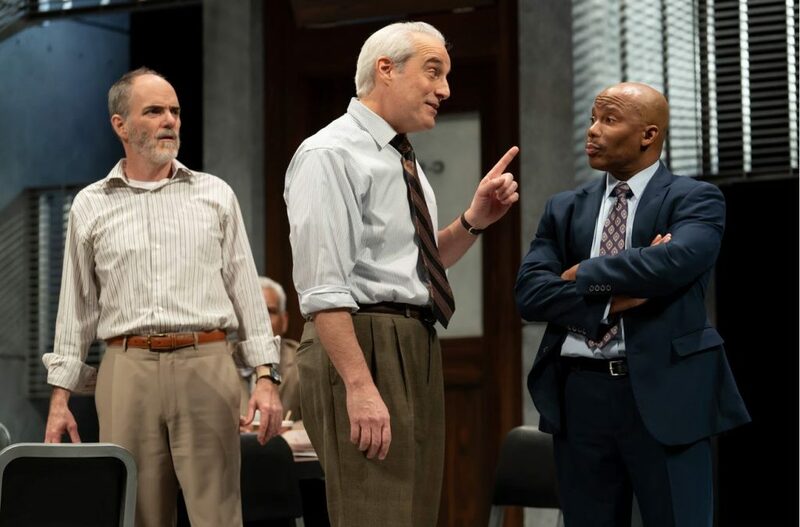 The play’s characters are listed by number – First Juror/Foreman through twelve – and set in the deliberating room where the personalities and backgrounds of each man becomes relevant. 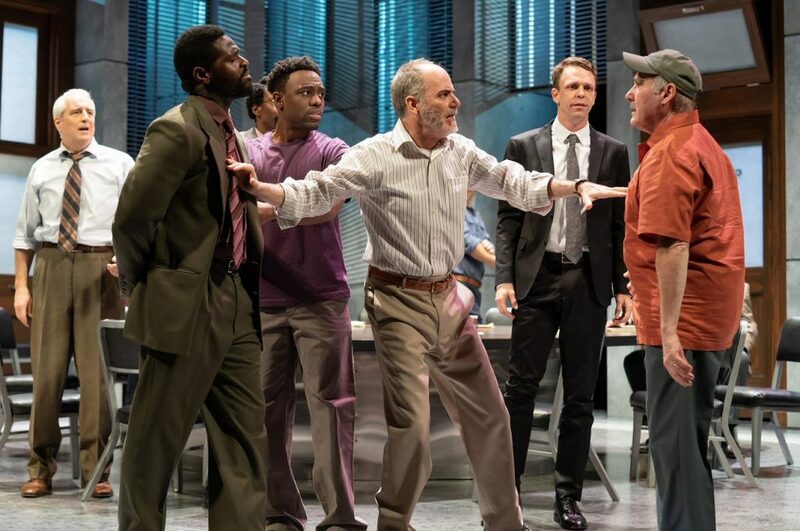 In a particularly cruel generalization, one juror declares, “Human life doesn’t mean as much to them.” Director Sheldon Epps’ deliberate choice to cast six black and six white actors as jurors gives us license to look for signs of prejudice in both camps. We do, and there it is. We never meet the orphaned teen or his father, whom he is accused of killing, instead we hear fear-mongering and an ever-shifting set of supposedly incontrovertible facts which become suggestions, or worse, suppositions, based on the prejudices of each juror. During their deliberations, certainties become doubts as clues prove to be mere red herrings and the testimony of sure-fire witnesses proves faulty. Highly recommended. A cast of exceptional veteran actors keeps the tension palpable. 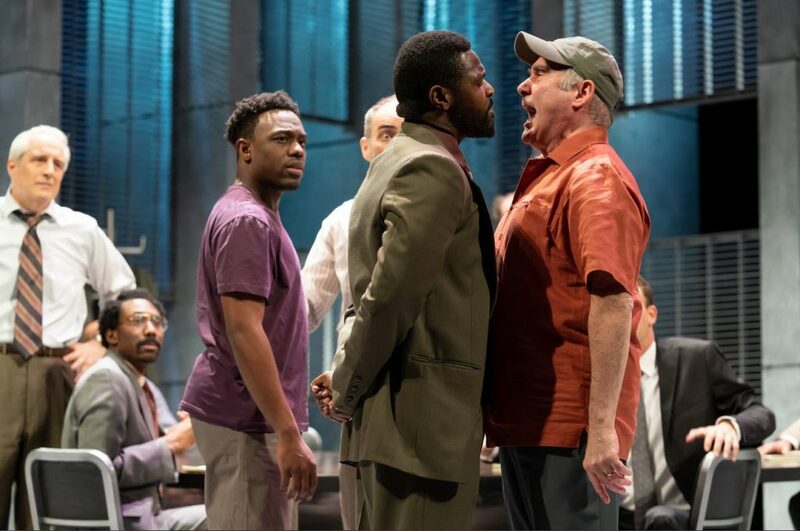 With Eric Hissom as First Juror/Foreman; Sean-Maurice Lynch as Second Juror; Michael Russotto as Third Juror; Christopher Bloch as Fourth Juror; Bru Ajueyitsi as Fifth Juror; Jason B. McIntosh as Sixth Juror; Lawrence Redmond as Seventh Juror; Erik King as Eighth Juror; Craig Wallace as Ninth Juror; Elan Zafir as Tenth Juror; Bueka Uwemedimo as Eleventh Juror; and Brandon McCoy as Twelfth Juror. Scenic Design by Stephanie Kerley Schwartz, Costume Design by Wade Laboissonniere, Lighting Design by Dan Covey and Sound Design by John Gromada. Through February 17th at Ford’s Theatre, 511 10th Street, NW, Washington, DC 20004. For tickets call 888 616.0270 or visit www.Fords.org.